I am so blessed to have wonderful friends in my life. Sarah is a stitching buddy that I hang with on Avery Island every year. 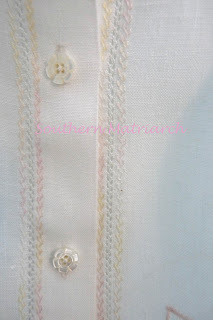 The gown above was one of two projects at La Broderie Bayou 2010. 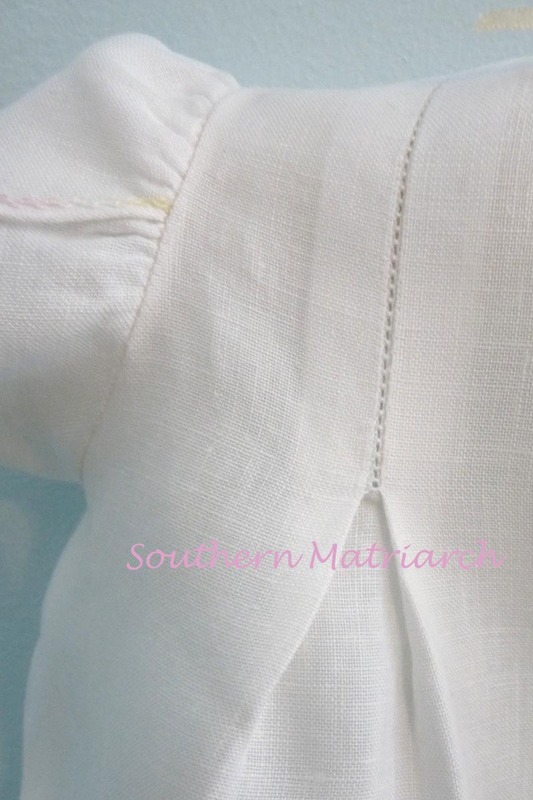 This linen gown was taught by Gloria Rivera. Sarah got her gown finished lickety split in spite of the miles and miles of hemstitching. I admit with all that was going on around here since mid June, mine was put away without any guilt what so ever. My brain wasn't into it this summer. I can't imagine why. Imagine my surprise and glee when Sarah asked if I had anyone around here who might be available to "borrow" her finished gem. Sarah doesn't have any little ones in her life right now. I jumped at the chance to give her exquisite gown a foster home. As always click on the pictures for a close up. The above picture makes the neck look wonky. It does meet, not sure why it looks funny in the picture. 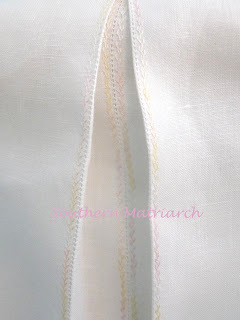 This is a close up of the drawn thread work and embroidery on the frint skirts. Sarah does gorgeous work. This is one of the hemstitched tucks on either side of the dress front. This precious gown also features sweet little petal sleeves. My daughter loves the little sleeves which really surprised me. I didn't think she would like that. You never know. The details of the gown are wonderful. 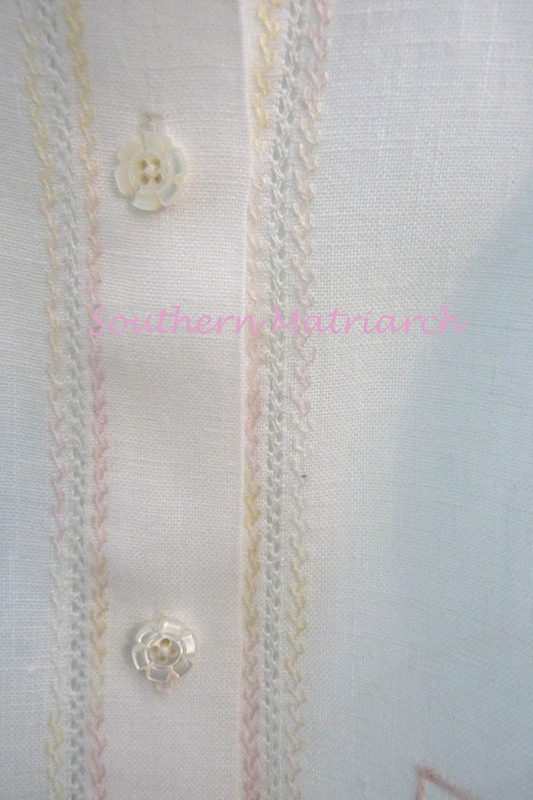 Here is the delightful hemstitching and gorgeous feather stitching on either side of the front placket. 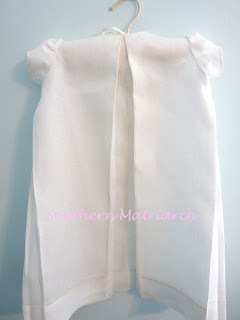 The back features a deep tuck that is outlined with with hemstitching and more feather stitching. Here is the back tuck up close. 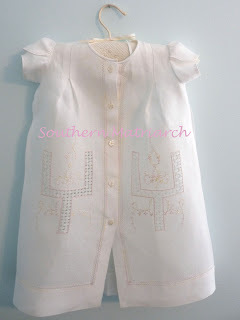 All of the embroidery is done with DMC Color Variations floss. A sweet mix of colors. the gown modeled by our very own center of attention. It fits her wonderfully and will for a while. Our Mommy loves the gown. Baby is wearing it over a blue Swiss flannel slip. 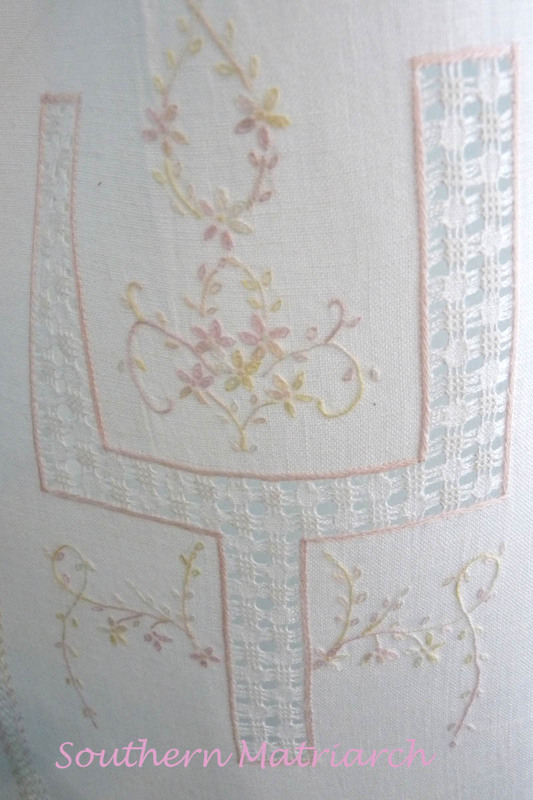 It really makes the pink embroidery and drawn thread work pop. 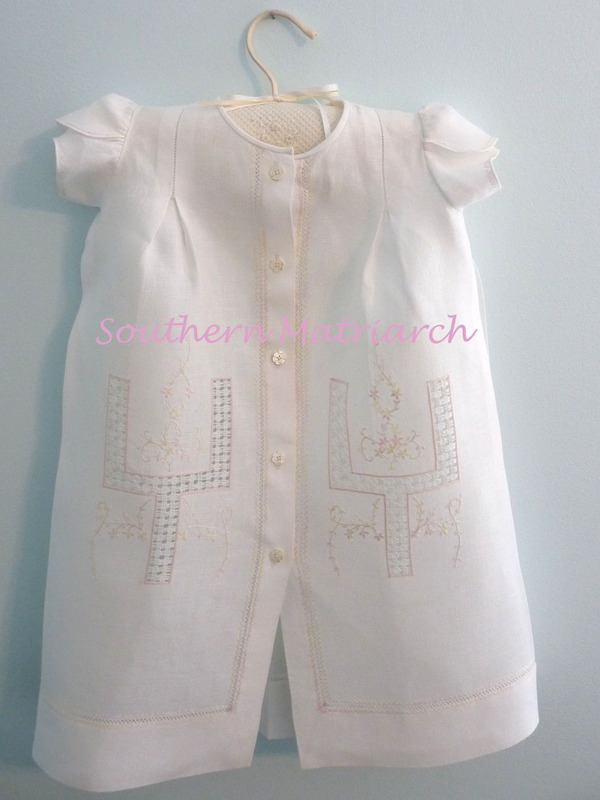 Thank you Sarah for thinking of us when looking for a foster home for this beautiful gown. WOW !!! That is a work of art, beautiful, beautiful !!! What an incredible, exquisite gown!!!!! Sarah, it is so beautiful, and thank you for offering to the beautiful model Evamarie for "fostering!" Wow! Took my breath away! Breathtaking, and Evamarie just makes it even moreso! I love the basketweave look of the drawn thread on the front. Thank you, Sarah, Martha and sweet baby! ohhhh that is just beautiful! I always love to come to your blog for eye candy!!! Love the dress but it is even more beautiful on the model! what a work of art that gown is!! Evamarie looks so precious in it! Aren't you having fun dressing this baby??? Exquisite! Eva Marie's beauty really showcases the gown. Wow! That's incredible, and of course, having a precious baby to fill out the wrinkles makes it even more beautiful! Great job of finishing the dress Sara. It came out beautiful and Evamarie sets it off perfectly. 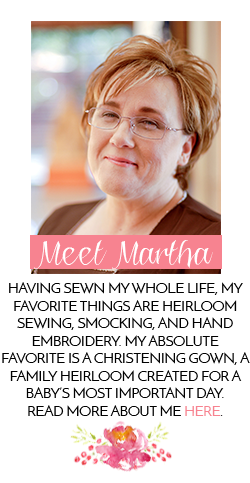 Martha is lucky to have a friend like you! Wow that is a good friend to let you borrow that dress. :) She did a great job on it. That's just amazing, and she did well to lend it out because the best photo is the one of it on the baby. Martha, the dress is a treasure. 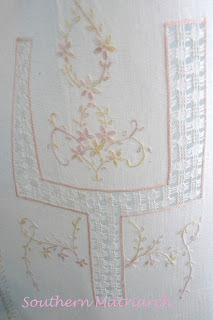 Beautiful work and a wonderful choice of embroidery thread. 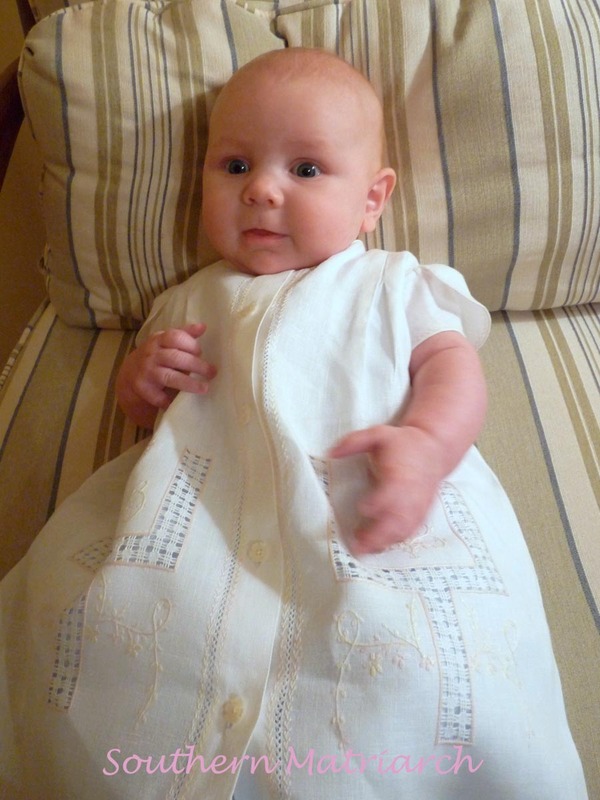 Could I ask you please, what fabric was used. From the photos it has a linen look. 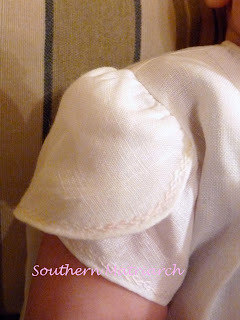 Just wondering if I ever consider "making holes" in fabric what a good choice would be. I love your Blog and your little grandgirl!